City Hall, the Wilson Building, had a shelter in the basement. 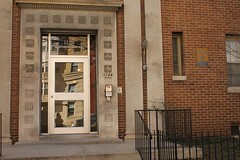 I went to work there in 1968 and when I found out there was a shelter I thought it was a joke. After all, they weren’t going to bomb Baltimore and if the Russians dropped the bomb on DC everything between the White House and the Capitol would be done for. The last time I was in the shelter was the day Skylab fell to earth, July 11, 1979. At the time there was a lot of media coverage about when and where it would hit, so we had a party in the shelter for all us folks who were ‘afraid’ of being hit. In 1962 I graduated from Syracuse University with a Bachelor’s Degree in Electrical Engineering, but I needed a summer job before continuing on for a Masters Degree. Erdman & Anthony, a consulting engineering firm in Rochester, New York, had a contract to determine locations in existing facilities that could be used to provide protection from fallout in the event of a nuclear attack. They hired about twenty engineering students, salary based on level of education. As a graduate, I received the top level of $3 per hour. (That was a step up from a previous summer’s construction job of $2.50 per hour, although that job did pay time-and-a-half for hours greater than eight each weekday and double-time for weekends. Since we worked ten hours during the week and eight on Saturday, it added up to 71 hours pay. That, along with scholarships, was enough to finance another year of college–of course, that left little time, not to mention energy, for any social life.). After two weeks of intensive instruction in the extensive government manuals used to determine the amount by which given constructions could reduce radiation, we fanned out, in pairs, across the city to examine likely candidates, as determined from detailed construction plans provided by the city. Of course, we were given impressive federal government credentials to convince naturally-suspicious building managers of our intent, and authority. We recorded detailed notes and measurements at each site, including information on the thickness and construction material of each ceiling and wall between the space and the exterior areas where fallout could accumulate. Back in the office (two at a “table”– unfinished doors on sawhorses–and seated on office-supply-rental folding chairs) we transferred our findings onto government data sheets, performed the calculations specified and, if an area met specified standards, determined how many people could be sheltered there. Over the course of the summer, I learned a lot about the the subterranean underpinnings of a modern city. Perhaps the most unusual site I examined was the Genesee Brewery. It was well shielded and spacious enough to accommodate hundreds, if not thousands, but there was the slight disadvantage that the temperature suitable for brewing was a little cool for long-term habitation–about 60 degrees! I grew up as a pastor’s kid and lived in the Church which was a fallout shelter. I was born in 1954 and didn’t move out until my early 20s. 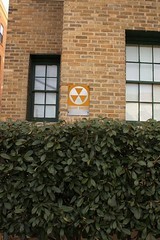 The fallout shelter signs were in place and the shelter supplies were there at that time. Grace Lutheran Church at 4300 16th St., NW, at the corner of Varnum St.,is the address of the Church and where I grew up. 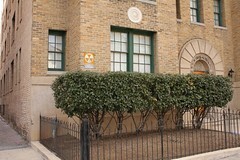 Signs were located on the main floor of the santuary building and the educatiopn wing directing persons to the basement. I remember that there was an outdoor sign facing Varnum St. All of the signs were of the design described in John Kelly’s Post article this morning. I was fascinated with the supplies. They included large dark-military green oversize barrels that stored water and had instructions painted on them for how to convert them to toilets. There were numerous boxes with black ink printing. I assume that these were the food and medical supplies. I remember that one of the many break-ins (i.e., burglaries) of the Church was to get the drugs from the shelter. I don’t think the criminals were effective, but even if they were, I’m sure the missing contents were restocked. The fallout shelter supplies were in an unmarked and locked closet. I had a master key to the Church so that I could open and close the facility and my key worked on the closet. It is located on the basement level of the education wing, right were it attaches to the older sanctuary basement. It is on the left and a men’s room is on the right. I have no idea if the contents are intact. With said that, by the very nature of church organizations being volunteer based, someone would have to move the shelter supplies and get rid of them; it seems to me that it would be easier to leave them in place rather than hauling those barrels up the stairs.